For a man who has been forced from his job and now faces the possibility of at least a decade in prison, Jacob Zuma seems remarkably unworried. 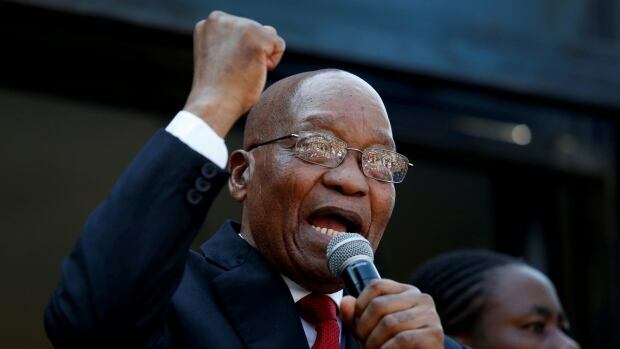 South Africa’s former president made a brief appearance in court in Durban this morning, as his trial on 16 charges of corruption officially got underway. The pro forma session lasted just 15 minutes. Then he went outside to sing and dance. “I have never seen it before where someone is charged with a crime, those charges are dropped, and then years later those same charges are reinstated,” the 75-year-old ex-president told the crowd in Zulu. The charges against the former politician date back to 1999. He is alleged to have received 783 separate bribes to deflect government scrutiny of a $4.8 billion US deal with Thales, a French arms manufacturer. former financial advisor, Schabir Shaikh, was found guilty of soliciting the payouts in 2005 and sentenced to 15 years in jail. But the charges against Zuma were dropped just before he ran for president in 2009, and only brought back two years ago. “I keep asking what has Zuma done and no one has an answer for me,” the former president said today, lapsing into the third person. He returns to court on June 8. But political defiance in the face of prosecution is in ample supply these days. Luiz Inacio Lula da Silva, Brazil’s former president and the frontrunner in this fall’s election campaign, is currently barricaded inside the offices of a metalworkers’ union in his hometown near Sao Paulo, trying to decide if he will turn himself in to police. that the 72-year-old leftist must start serving a 12-year sentence for corruption, even as he appeals the verdict. Last year, Lula was convicted of taking a beachfront apartment from a construction giant in exchange for political favours. Under a warrant issued last night, he has until 5 p.m. local time to surrender to authorities in the southern city of Curitiba, or face arrest. suggests that Lula would easily win re-election if allowed to run, despite the scandal. Meanwhile, events in South Korea today may have offered Zuma and Lula a vision of their future. A court in Seoul sentenced Park Geun-hye, the country’s former president, to 24 years in jail and fined her $22 million after finding her guilty of bribery, abuse of power and coercion. It was less than the 30 years and $145 million fine prosecutors had sought. She was later found guilty of conspiring with an old school friend to extort multimillion-dollar payoffs from some of South Korea’s largest companies. The money was earmarked for her daughter’s education and some non-profit, family foundations. Still, about 1,000 of her supporters gathered outside the court today to protest the jail term, waving flags and banners. been in custody for more than a year, and was not in court for her sentencing. She maintains her innocence. South Korea is ranked 51st out of 180 nations in the latest World Corruption Index. South Africa placed 71st, and Brazil came in at 96. The Spanish government has lost its initial bid to extradite Carles Puigdemont from Germany on a charge of rebellion, but is not backing away from plans to put Catalan’s separatists on trial. A regional court in northern Germany ruled yesterday that a European arrest warrant for the deposed president of Catalan was “inadmissible” because the equivalent German charge of high treason involves violence — something that was absent from the Catalonian independence referendum. Puigdemont, who was arrested March 25 as he was travelling from Finland to his new home in Belgium, was released today on $117,000 bail. He must surrender his passport and remain in the country while the court considers another Spanish demand to extradite him on a lesser charge of misuse of public funds. Former Catalan leader Carles Puigdemont, right, and former member of the Government of Catalonia Clara Ponsati attend a news conference in Brussels in October 2017 after fleeing Spain. (Yves Herman/Reuters)Addressing the media outside the gates of a prison in Neumuenster, the ex-president said Spain’s “violent and repressive” strategy had failed. But if Spanish authorities have been chastened by the setback, it’s difficult to detect. On Thursday, they indicted the former head of the Catalan police — lately hailed as a hero — for belonging to a “complex” criminal organization — to whit, the independence movement. Josep Lluís Trapero, the ex-head of the Mossos d’Esquadra, received commendations for his force’s response to two August 2017 attacks in Barcelona and Cambrils, and the subsequent manhunts that saw five Islamic militants shot dead. aiding and abetting Catalan separatists by failing to close down polling stations and seize ballot boxes during the independence vote, or stop crowds from vandalizing vehicles belonging to Spain’s national police. Two other members of the Mossos face similar charges. However, the next legal battleground will be in Scotland, where Puigdemont’s former education minister is also fighting an extradition request on charges of rebellion and corruption. Clara Ponsati, a 61-year-old professor and and ex-head of the School of Economics and Finance at the University of St. Andrews, was arrested on a European warrant on March 28. She had initially fled to Belgium, alongside Puigdemont, last October. Following a bail hearing in Edinburgh last week, her lawyer Aamer Anwar told reporters that Ponsati was mystified by the allegations. Sympathy for the Catalan independence movement has always been strong in Scotland — given the obvious parallels. And several prominent members of the Scottish National Party were on hand to lend their support during Ponsati’s brief court appearance. A crowdfunding campaign for her defence raised more than £170,000 in just a few hours, and now stands at £232,000 — $414,000 Cdn. and argue that it is not free and independent, but rather under the control of Prime Minister Mariano Rajoy. Anwar adds that the case could drag on for months or years, winding its way through the U.K. and European courts. The Puigdemont government was in power for 655 days. And its self-proclaimed Catalan Republic lasted only a few hours. Enjoying this newsletter? Sign up and have it delivered by email. You may also like our early-morning newsletter, the Morning Brief — start the day with the news you need in one quick and concise read. Sign up here. Sergei Skripal and his daughter Yulia have made a remarkable recovery after being poisoned with a nerve agent, and both are reportedly out of immediate danger. Dr. Christine Blanshard, the Medical Director at Salisbury District Hospital, issued a statement this morning confirming that the former Russian intelligence officer and double agent is now on the mend. “He is responding well to treatment, improving rapidly and is no longer in a critical condition,” it read. Both father and daughter remain in hospital. The statements confirm reports of their improved health in the Russian media earlier this week, which featured a recording of a phone conversation between Yulia and her cousin Viktoria. At the time, British authorities were still saying that both the Skripals were in critical condition. Not all the news is good, however, as it appears that there were fatalities in the attack — a cat and two guinea pigs. sealed off inside the Skripal’s house as emergency workers tried to contain the damage from the nerve agent that had been smeared on the front door. On Wednesday, a Russian foreign ministry spokeswoman had raised pubic questions about their well-being. Last night, The Sun newspaper reported that the cat, a black Persian named Nash Van Drake, was found alive but in a “distressed state” when investigators finally made their way inside, several days after the poisonings. He was taken to the nearby U.K. Ministry of Defence labs at Porton Down to be tested. The two unnamed guinea pigs reportedly died from dehydration, and were also cremated. All of which has the Russians alleging a cover-up, and demanding a further explanation. The animals were “important evidence,” the Foreign Ministry’s Zakharova said in a Facebook post, questioning why their bodies were disposed of. “They are really ‘important witnesses’ when it comes to a chemical substance, which, in a number of versions, could have been used in the Skripals’ house,” she added. — a Russian military research facility in Shikhany, in the country’s southwest. The top secret briefing convinced 28 countries, including the United States and Canada, to expel more than 150 Russian diplomats as punishment for the attack on the Skripals. – Jamie Dunning, an ornithologist at the University of Nottingham, on his recent discovery that puffin beaks are fluorescent. April 6, 2000: Is wrestling too raunchy for kids? As the new millennium dawned, the World Wrestling Federation was “more popular, more vulgar and raunchier than ever.” But the coarse language and sexualized storylines on its broadcasts had some viewers complaining to the CRTC, and stars like Chris Jericho and Bret “The Hitman” Hart worrying about the children. How much lower could pro-wrestling sink? Well, Wrestlemania 23 was still seven years away.